Do you want to buy a Hobonichi Cousin but don’t know what to use those daily pages for? I’m not a daily planner but I really wanted a Hobonichi Cousin in A5. I loved the weekly layout and the space you get in the monthly pages. They wouldn’t get used for work as I work Monday to Friday 9-5 and have a different planner (Hobonichi Weeks) that I use for that. I therefore realised I’d need to find a use for all those daily pages in the Hobonichi Cousin as I wouldn’t want them to go to waste. I figured I could use the dailies for all the ‘other’ planning things that would normally go in different sections of a Filofax, for example. The reason why I never fully committed to either a Happy Planner or Erin Condren planner was the lack of space for ‘other’ stuff in there. I always had to have a Filofax to go alongside them with things like blog and shop plans and finance tracking etc. 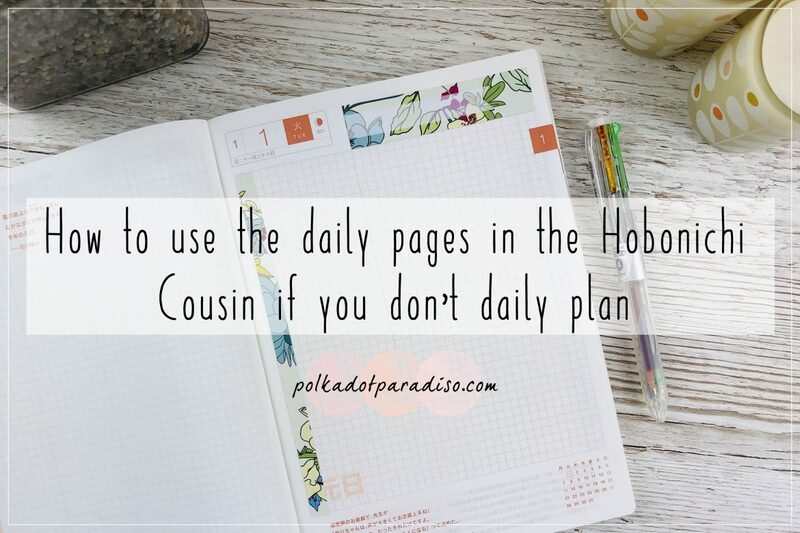 With over 300 daily pages there would be plenty of space in the Cousin for all of those things. After a year of using the Cousin this way I thought I’d share some examples of what I’ve been using those pages for. You can’t beat a bit of goal planning. This is something I’m not very good at it. Actually, that’s not true. I’m good at setting goals, but I’m not very good at going back and reviewing them. I used my daily pages last year to list what I wanted to achieve, which I then split out into monthly tasks/goals. This year I’ve done something similar but haven’t really mastered how to keep my goal planning ‘alive’ throughout the year. I have pages for sticker ideas, pages for each of my kits to track which of the sizes I’ve made them in and pages tracking new releases. Relatively simple but incredibly useful pages! It’s great to have this in the same book as my weekly planning as it means if I have an idea out of nowhere I’m more likely to jot it down before I forget. This is something I’ve refined for 2019 but in 2018 I used the daily pages to create extra monthly spreads. I then used these to plan out my social media for each month. Every time I go away somewhere I have to write a packing list. One daily page is the perfect size to write the list. It’s handy to have in my Cousin because the next time I go somewhere I can just refer to the old list to check that I haven’t forgotten anything (which generally happens). I try and write the list in the day I’m going away so it’s easy to find again. It’s not something I do loads myself, but journalling is a popular choice for the Cousin’s daily pages instead of traditional planning. I follow a lot of inspirational Hobonichi journallers on Instagram and I love seeing their pages. Because the paper of the Hobonichi can take watercolour brilliantly you can really create some beautiful pages. The past two days were pretty awful. I had yet another migraine attack. So to distract myself from the pain I illustrated and practiced in my Hobonichi. Bit of an obvious one but it’s great to use the dailies for notes. I don’t like the idea of having a separate notebook for things like holiday planning or notes from You Tube tutorials I’ve watched, so having everything together in the Cousin is perfect. The pages are also very good for pen tests! This is something I’ve moved into my health and fitness Weeks in 2019 but in 2018 I used my daily pages for exercise tracking. One page was for the routine I was doing and the other was tracking the dates and weights I was using. I have a new workout routine and so I have a new spread in my Hobonichi to track it! It was when I was setting this up that I realised I was basically using my daily pages how you would use a bullet journal and was filling them with collections. This realisation has opened up even more ideas of how to use these pages. I made a TV show tracker! We’re watching so many programmes right now I needed one! I got annoyed with having to cover up the bits I didn’t need on the daily pages, so I created to stickers to cover those bits up. These have been really handy stickers to make my pages look neat and add some decoration. I don’t use them on all pages, but I do on pages that will be used often, such as my blog and social media planning. If you like these, you can find them in the shop here. Using the yearly pages as an index is extremely helpful if you’re going to be using your dailies for other things. This was really useful last year and now I’ve used my yearly pages for something else (blog post planning) in 2019 I’m a little lost without it. Hopefully this has helped to give you a few ideas about how to use your daily pages. Without finding these uses I would have struggled to justify using a Cousin this year. I also may have gone back to Filofaxes just to keep all my planning together. This also made me realise that the Cousin is a great alternative to bullet journalling. If you don’t like drawing out your weeks or days this is the perfect alternative. I don’t know why I don’t see this recommended more as an alternative. Do you use your daily pages for anything different? I’d love to know in the comments. If you are looking to purchase a Hobonichi Cousin, take a look at my how to purchase post here.